We love sharing what goes on at Saint Vintage with our glamorous fans! Last month, it was all about the support we received for Breast Cancer Awareness Month and our pink jewelry. 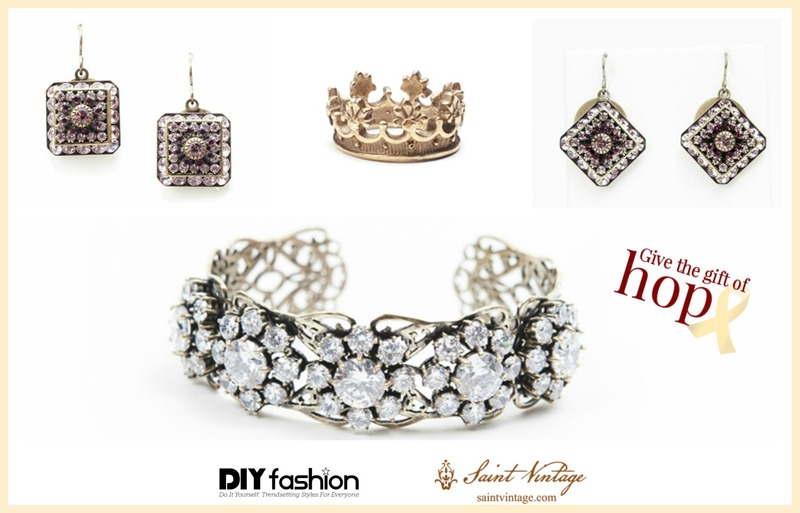 This month, it is all about stunning celebrities showing off their sparkle in our vintage jewelry! So far, both Jeannie Mai and Tamera Mowry-Housley have been spotted in our pieces on their daytime talk show, The Real. We are so lucky to have these beautiful women wearing our jewelry and raising awareness for cancer research! 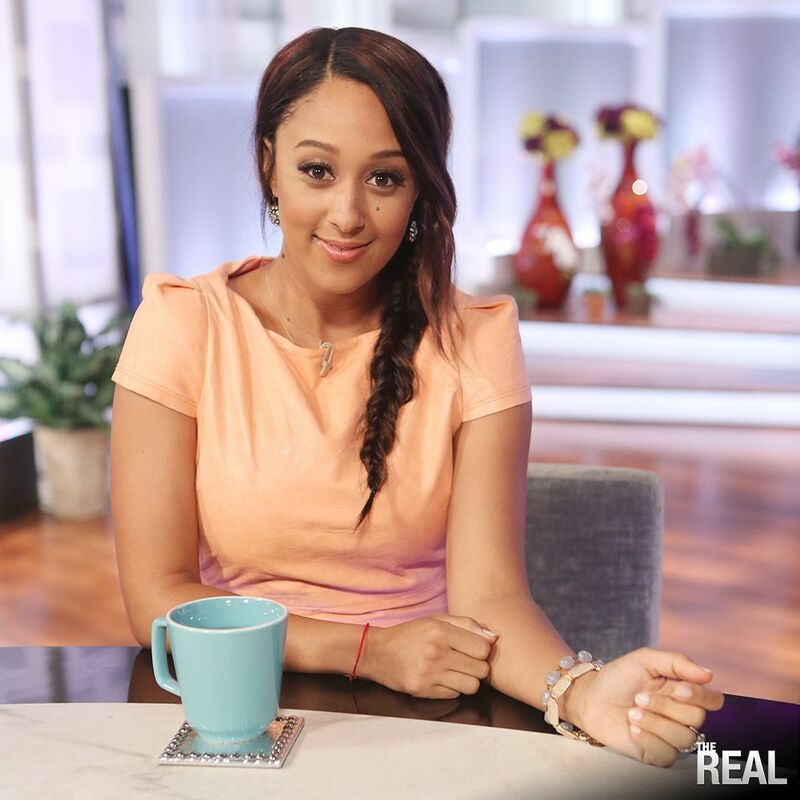 On Tuesday, Tamera rocked a simple peach-colored dress and fishtail braid. To complete her look, she wore a pair of crystal Love Drops and a bracelet from our Love Links collection! Tamera has always been a fan of our jewelry and we are beyond grateful for all of her support! On Wednesday, Tamera rocked another one of our glamorous accessories! (See? She really is one of our biggest supporters!) For this episode of The Real, she wore an elegant off-white knee-length dress and paired one of our Love Links with it! Simple, yet classic. Shop these collections to get their looks, or find your own piece of glamour! If you want to show off one of your Saint Vintage looks, follow us on Twitter or Instagram and tag #saintvintage! We would love to share how you are rocking our jewelry. And follow us on Facebook to see what’s going on more than just once a week! What do these colors stand for? In November, they represent love for cancer warriors & support for cancer awareness! The purple ribbon is for pancreatic cancer awareness, the white ribbon stands for lung cancer awareness, and periwinkle is the color of support for stomach cancer! We want to encourage you to learn more about these cancers and stand in support of those affected by them! Pancreatic cancer begins in the tissue of the pancreas and, unfortunately, is incredibly difficult to diagnose. Even when diagnosed early, pancreatic cancer often has a poor prognosis – spreading rapidly throughout the body. Once it’s too advanced, surgical removal is impossible, which is the one method able to completely rid the cancer from the body. Chemotherapy can greatly improve someone’s quality of life though! Lung cancer is the number one cause of cancer death in both men AND women worldwide. The number one risk factor linked to lung cancer is cigarette smoking (and even passive exposure to tobacco smoke), which is why doctors immediately recommend seeking help to quit smoking. This cancer is also not usually spotted until it’s in an advanced stage, which means that the five-year survival rate drops to 1-5%. Stomach cancer, also known as gastric cancer, is not as common in the United States, but it is still a very aggressive form of cancer if it is not detected early. Thankfully, there has been a decrease in the number of people affected by this form of cancer over the past 60 years, but advanced stages are very difficult to treat once diagnosed. The best way for you to get involved is to raise awareness and donate to cancer research organizations so that they can continue searching for the cure! If you purchase a bracelet from our Love Cures collection (like the ones above! ), we will donate 50% to Stand Up to Cancer immediately! Our jewelry is made to showcase the strength of women fighting cancer while also standing up to cancer for everyone! Pick the colors you fight for with Saint Vintage! Follow us on Twitter to see more looks for November! The color red can stand for a lot of things; love, power and most importantly, fashion! Featured below are a few pieces from our collections that showcase the vibrant color, red! From our Love Cures collection, try our Fiji Love Cures Bracelet on for size! This bracelet features an antique brooch created into a one of a kind stretch bracelet using vintage beads. A truly stunning piece of arm candy from our Wear a Bracelet, Find a Cure Campaign, which donates 50% of profits to Stand Up to Cancer to help fund cancer research. What about a pair of Padparadscha Earrings from our Love Drops collection? These earrings feature Precious Padparadscha colored flower crystals with a vintage touch to make up two adorable Love Drops. Wear them with your most casual or glamorous outfit & make a statement in red. Maybe a piece from our classic Saint Vintage Collection is what you’re looking for. Try our Rosemary Necklace, a sweet and dainty delightful necklace that features pink sparkles to make up a simple yet chic piece of jewelry. It just might be the perfect accessory for your little black dress. All of our jewelry is handmade in Atlanta with one mission: to help find a cure for all kinds of cancer. Join our journey and help us find a cure. For more Jewelry with a Cause, shop online at Saintvintage.com and be sure to follow us on Facebook, Twitter, and Pinterest. Beach it this Summer in Style! Only 15 days until summer! Who’s ready to hit the beach? Something that goes hand-in-hand with the beach is the boardwalk. If you’re looking to glam up your evening boardwalk attire, look no further! Saint Vintage has earrings, bracelets, and necklaces that will match your breezy summer night’s outfits. Our Providence Hope Love Cures bracelet is just one of the many perfect summer time bracelets. Not only is it a gorgeous blue, quite like the sea, but it has a cute anchor charm that says hope, too! Can it get any more perfect? Yes! This bracelet, like all the bracelets in our Love Cures collection helps to fund cancer research. When you purchase a bracelet from our Love Cures collection, 50% of profits are donated to Stand Up to Cancer. Feel good both day and night this summer by soaking up the sun during the day and wearing a piece of jewelry with a cause during the night. You can view all of our handmade jewelry at Saintvintage.com and follow us on Facebook, Twitter, and Pinterest for more jewelry with a cause! Wear Black & Grey for the Month of May! Happy May! We are that much closer to summer; 49 days to be exact! What exactly does the month of May have in store for us? Two very important cancer awareness ribbons, that’s what! For the month of May we support Brain Cancer Awareness by wearing the color grey, and Melanoma Cancer Awareness by wearing the color black. This upcoming Monday, May 5th, is Melanoma Monday. Spend the day spreading awareness, educating yourself and others, and most importantly showing support. May is also home to Skin Cancer Detection and Prevention Month. As the summer quickly approaches us, it is important to not only know how to protect yourself against skin cancer but how to also identify possible signs of skin cancer. With skin cancer being the most common type of cancer, there are ways of defending yourself from the harmful rays of the warm sun. For more information on skin cancer, click here. Be sure to check out our Love Cures collection where 50 percent of profits go to Stand Up to Cancer to support cancer research. Whether you support Brain Cancer, Melanoma Cancer, or any other type of cancer(s), we have a bracelet in your support’s color. When you wear a piece of Saint Vintage, you are wearing more than just a piece of jewelry; you are wearing a piece of “Jewelry with a Cause”.